Gregg wanted me to electrify a couple of his awesome raptors, so...ZAP!! HERE is Gregg's cool original!! Both the original and this one are outstanding. This is such a cool program! Spooky but I like it. Well done, Randy. So cool Randy! This one really turned out beautifully! Life is the pits sometimes, but God and your friends are always there to help you through it. Karr'Acking!..work on what is/was a great piece a work! superb! dramatic and don't argue with anyone with a stare like that! lol! Very dramatic and scary and at the same time beautiful. Fascinating! Thank you Randy for taking the time to fry my raptors. This effect is very cool, I love it. You the man. Whoa! That sure created a dramatic difference. Now he looks like an 'Old' wise one. I like the cropping too. It's Owl Man...super look ere Rudy. Tons of thanks for checkin' out this rework of Gregg's awesome raptor and thanks to him for askin' me to zap this bad boy!! Awesome Randy. I love it. thats very cool mate - what program is that? I love this pic, just the whole mysteriousness of it really pulls you in, pretty sweet. When you leave me, can I come too? Wow I love it really the colors and the expression of the Owl. 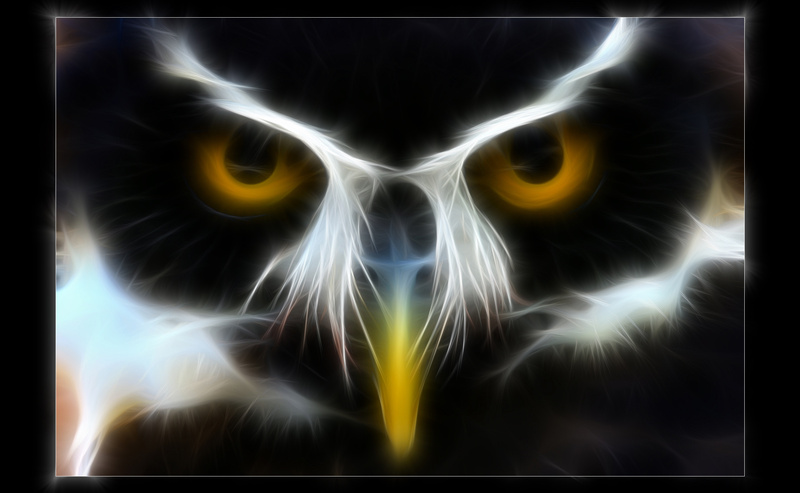 What i mean is how the Owl is staring is kinda creepy but cool in the same way. Very spooky indeed and yet very pretty!